Real estate marketing door hangers can be used to announce an open house, a recently sold property or as a general promotion. Door hangers are an effective way to farm a specific geographic area, especially as a supplement to your existing marketing. Door hangers allow you to get creative with your messaging and add extras to make your brand stand out. Real estate door hangers are not often considered a staple in any marketing campaign, but the truth remains: they can provide a lot of added value for a relatively low investment. Using door hangers can help increase your leads and build your rapport, making them an effective supplement your direct mail, bandit sign or other marketing efforts. What Are Real Estate Door Hangers? Real estate door hangers are an easy addition to your marketing efforts that can help you better connect with people in a specific area. Real estate door hangers can be used to announce an open house, a recent sale in the neighborhood, a promotion you are offering or a seasonal greeting. Door hangers allow you to get creative and have fun with your marketing, all without increasing distribution costs. More importantly, however, door hangers allow you to make memorable connections in your target neighborhood. Do Real Estate Door Hangers Actually Work? In short, yes. Real estate door hangers that work are a valuable supplement to any current marketing effort. A door hanger marketing effort is a broad approach that can help increase name and brand recognition, create higher lead conversion from your more targeted campaigns (think direct mail), and can help cultivate referral leads. While you may be reluctant to spend money on a door hanger marketing effort, there are a few reasons the expense can be well worth it. 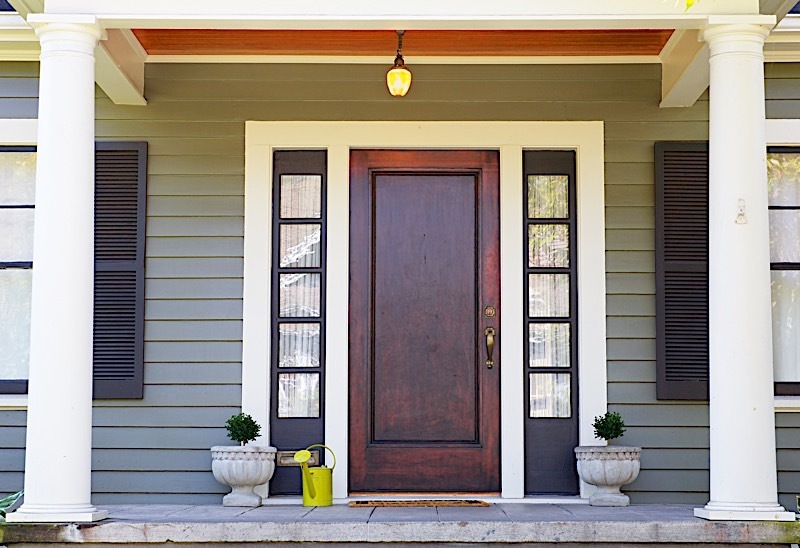 Effective real estate door hangers can position you as the leading agent or investor in a neighborhood, meaning that when it does come time for someone to list their home for sale or explore their options, you are the first name that comes to mind. A broad approach to marketing can be viewed as a more long-term marketing plan. The people in your area may not convert this month, or even in six months, but with regular points of contact, you are more likely to earn their business in time. Additionally, when you apply a broad approach to your marketing efforts, you are able to convert leads you never would have otherwise had access to. Door hangers will end up on the front door and in the hands of people who have friends looking to move, who are going through a divorce, or who just inherited a distressed property who they can then refer to you. A direct mail campaign will miss these friends, and you may miss an opportunity to make a deal. Hand-Deliver: If you are feeling extra-ambitious, you can go the DIY route for distribution. You’ll have to be prepared to cover a lot of miles and spend a lot of time distributing if you do it yourself, but when you hand-deliver your door hangers, you also get the opportunity to greet your neighbors and make a face-to-face connection, especially if you distribute over the weekend. National Distribution Services: National distribution services can deliver your door hangers for about 16 cents per unit. With these services, you can expect GPS tracking and even photo and video proof of the delivery of your door hangers, so you can remain confident that your message is reaching the intended homes. Local Distribution Services: Depending on where your area is, local distribution services may also be available to deliver your door hangers. While pricing varies by region, 15 cents per unit seems to be the going rate for local distribution. Charities: Another way you can get creative and give back to the community is to have a charity deliver your door hangers for you. Rather than pay a distribution service, you can pay a local charity or scout troop to deliver your door hangers. If you plan this in advance, you can even advertise this donation to the charity on the door hanger itself, allowing the door hanger to also serve as a PR promotion. Include magnets or notepads in a door hanger bag: Branded magnets that include pertinent information (tide schedules, a calendar, a list of holidays or important local phone numbers) are likely to end up a fridge and stay there for as long as the information is useful. Branded notepads will work in a similar fashion, and both of these extras are something easy to include with a door hanger that would be too expensive in a direct mail campaign. Include a detachable business card: People are more apt to hold onto a small business card than a full-size door hanger in the long-run, so why not give them that option with your door hanger? Many door hanger printing services have the option of including a detachable bottom portion that can act as your business card. Otherwise, you can always simply use a paperclip to attach a card. Partner with a local Realtor to share costs: If you are an investor and not a Realtor, you may want to team up with your local real estate professional to share the costs of your door hangers and of distribution. There may be others on your team and in your network who would benefit from a shared door hanger campaign, too, including your contractors. Teaming up is a great way to implement cheap real estate door hangers and build relationships for your business. Include coupons for local businesses: Including coupons for a local business can be a great way to add immediate value to what you offer people in your farm area without incurring any additional costs. Ask around at local retailers and restaurants to see if any of them would like to extend a special offer. In the best case scenario, you may even get them to help cover your distribution costs. Pique curiosity with a guarantee: People want to know what is in it for them, so offering a guarantee gives them a reason to be interested in your services. Whether it is a guarantee to sell their house within a certain timeline or a guarantee of a quick closing, you’ll pique interest and build value around your services. Including door hangers for real estate as a component of your marketing efforts can go a long way toward increasing your leads and positioning yourself as a dominant force in a given geographic area. What do you think: do real estate door hangers work? Let us know how you’ve found success with this type of marketing in the comments below.